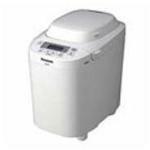 The Panasonic SD-2501 is one of the best bread makers on the market. Many people love Panasonic bread makers. If you want a way to make bread with less hassle, you can't go wrong with Panasonic. The SD-2501 is easy to operate and will win your heat. The best part is that it is energy efficient and easy to use. Don't wait any longer to get one. It also makes an excellent holiday gift. One outstanding feature is the Jam and Compote Mode, which allows you to make your own strawberry spread. You will love fresh spread with homemade jam. You can make blackberry jam, peach jam, and just about any jam that you can imagine. There are many different baking options available. You can even teach your kids to use it. One option is the Specialty Mode that allows you to make Gluten Free bear. Life has never been easier than with the Panasonic SD-2501. The Panasonic SD-2501 can deliver fresh bread any time you want. With this bread maker, you get an automatic raisin and fruit dispenser. This allows you to add ingredients at just the right time. This machine will help you to produce high quality bread. The best part is that this bread maker allows you to select from different crust colors and loaf sizes. It allows you to tailor bread to your personal taste. Now, you can enjoy fresh bread anytime you like. This is one kitchen appliance that you can't live without. Baking bread is now easier than ever. This bread maker is easy to clean. If you don't like cleaning, you will love the Panasonic SD-2501. It offers a Diamond-Flurobread pan and the kneading blade helps to prevent your bread from sticking. This makes it easy to take the bread out of the pan and it makes cleaning the pan easier than ever. The Panasonic SD-2501 is one tool that every kitchen should have. It is perfect for working professionals. Set the machine to make bread while you sleep and wake up to fresh bread in the morning. Who doesn't like fresh bread in the morning? After much research after my Sanyo Breadmaker died I bought a Panasonic SD-2501. All reviews rated it tops. I have to agree, it is as easy or as sophistcated as you want it to be. It makes very tasty, springy, good coloured loaves, Have not had a failure and have made 4 loaves a week for the last 8 weeks. Have tried some sweet loaves and pizza bases with excellent results. Would recommend it as a top class, easy to use, machine. Had it only 2 days, it wasn't the cheapest, but apparently the most reliable. 3 loaves later, and we're in love with it. Easy, lots of recipes, it's perfect for us. Fingers crossed it goes for years and years! Did a lot of online research and then settled on this one - not the cheapest, but apparently the most reliable for it's price. We've made 3 loaves in 2 days, and I LOVE it. Very simple, lots of easy recipes included - and the bread is delicious. Obviously haven't had it very long yet, but am completely in love already.